2018 UNESCO Oration, Deakin Downtown. 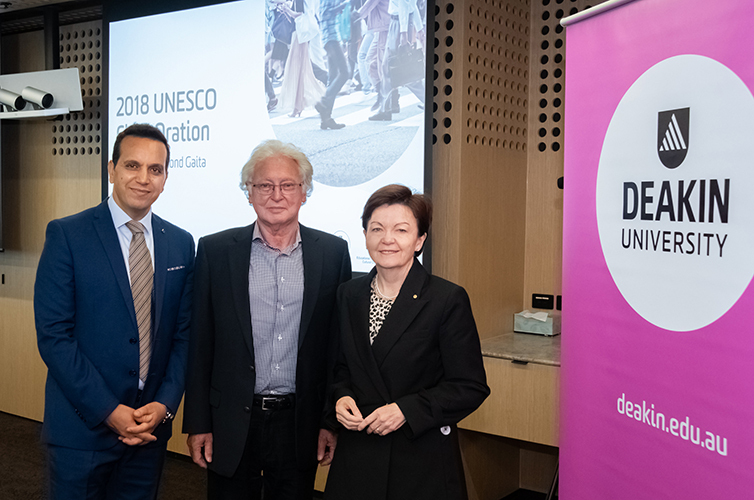 2018 UNESCO Oration – Professor Fethi Mansouri, Professor Raimond Gaita and Vice Chancellor Jane den Hollander AO. 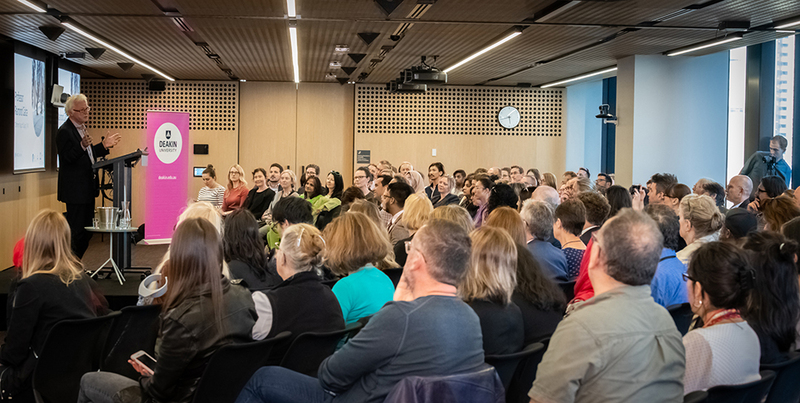 Professor Raimond Gaita was the 2018 UNESCO Chair Orator who spoke to his topic on ‘Different Ways of Saying ‘We” at Deakin University’s Deakin Downtown on 28 November 2018. He was welcomed by the UNESCO Chair of Comparative Research in Cultural Diversity and Social Justice, Professor Fethi Mansouri and Deakin University’s Vice-Chancellor Jan den Hollander AO. Professor Gaita began by proposing that a more appropriate title for his talk might be ‘They’re Human Just like ‘Us” as he problematised the complexities surrounding the use of the collective identity of ‘We Australians’. Focusing on the ongoing fraught relationship between indigenous and non-indigenous Australians, he raised the question of ethics in our common humanity and further wondered if we would ever dispute the name ‘Australia’. Citing attitudes of dismissal, as seen through the case with the Uluru Statement, he added that ‘the humanity we affirm is not fixed…when we acknowledge that racism is a denial of humanity. We must not assume we know in advance what that humanity is’. In our responses towards fractured intercultural relationships such as one so fundamental to the Australian identity, he argued that our collective responsibility should go beyond guilt and regret and involve grief and love.